The men’s podium from the 30 k freestyle individual start in Beitostølen, Norway. 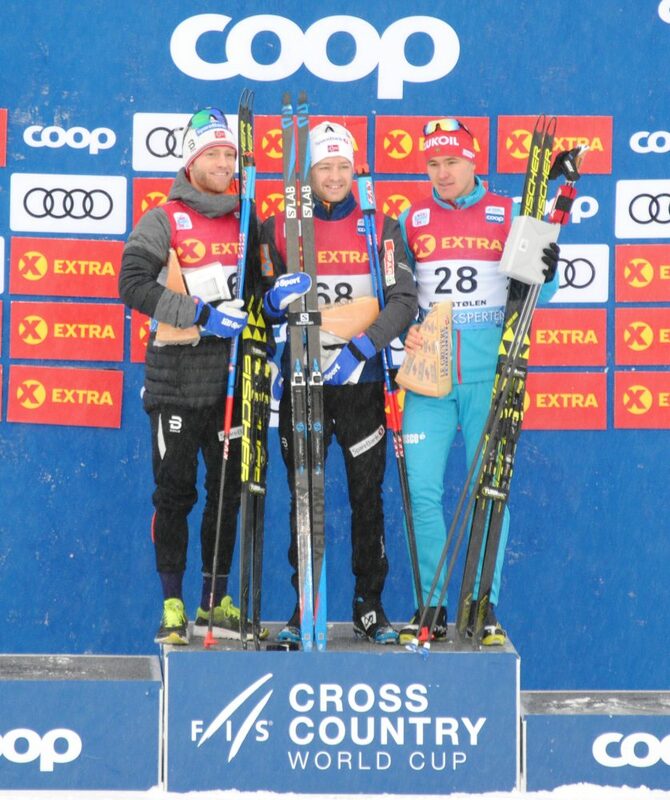 Sjur Røthe (center) of Norway placed first, teammate Martin Johnsrud Sundby (left) second, and Russia’s Andrey Melnichenko (right) third. It snowed continuously throughout today’s 30-kilometer freestyle individual Start in Beitostølen, Norway. There was already a great deal of accumulation on the race course by the time the men started. This made the already challenging distance race even more grueling as the fresh snow created more resistance for skiers. Norway took the top two spots as Sjur Røthe won the with a time of 1:09:53.5. His teammate, Martin Johnsrud Sundby, was close behind in second (+35.2). This is Røthe’s third podium of the season. 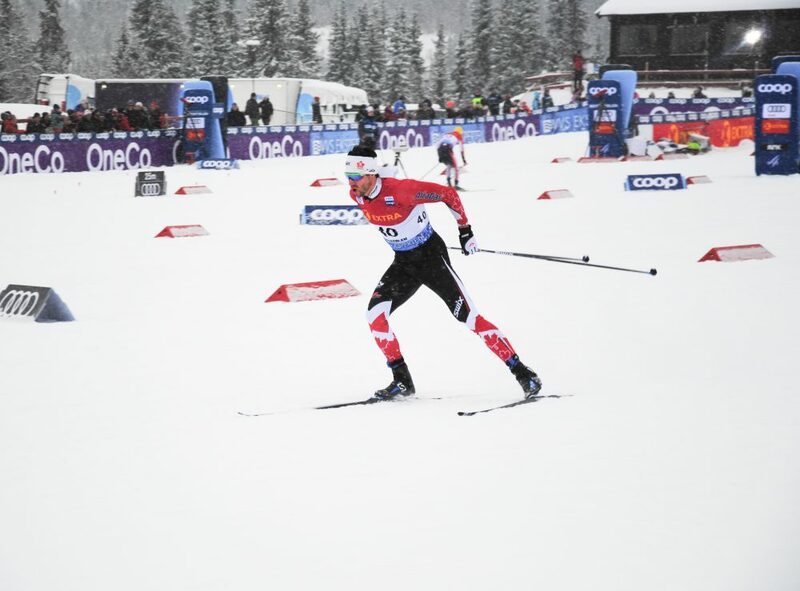 Last weekend, in Lillehammer, Norway, he won the 15 k freestyle individual start and placed second in the 15 k classic pursuit the following day. Sundby set the tempo for the first 10 k, outpacing Røthe by just seconds. 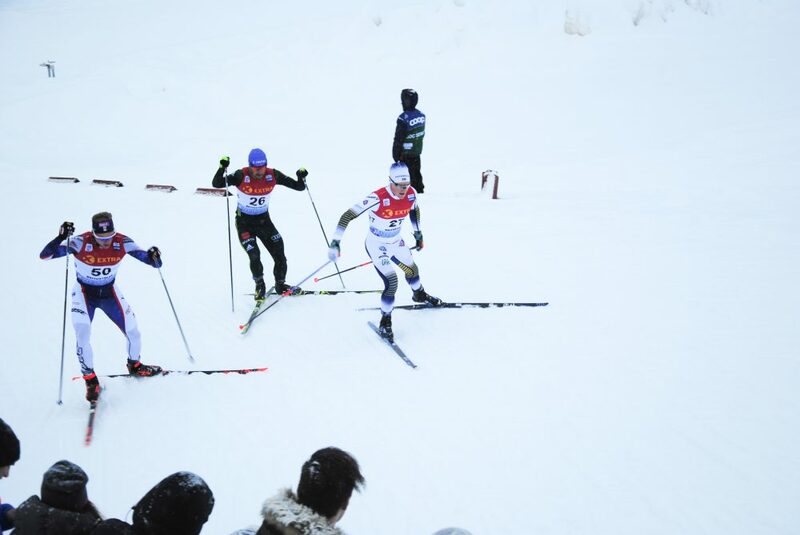 After the 15 k mark, Røthe took the lead and continued to put time between himself and Sundby. By 25 k, Røthe had a 30-second gap which he preserved for the remainder of the race. It was Sundby’s best result of the young season and his first World Cup podium of the year. Sundby placed fourth in Ruka’s 15 k classic, missing out on a podium by 10 seconds. Last season, Sundby was the third-ranked World Cup skier in the distance overall. Russia’s Andrey Melnichenko took third (+49.2). At twenty-six-years-old, this was Melnichenko first career World Cup podium. “During the race in different splits, I got some information that I was around the sixth place and actually did not expect anything more than that,” Melnichenko told FIS. Canada’s Alex Harvey during the World Cup’s 30 k skate individual start in Beitostølen, Norway. Harvey placed 13th. Alex Harvey of Canada was the first North American to cross the finish line. Harvey finished in 13th (+1:49.8). Harvey has been known to come into form later in the season for distance races, this year he came on strong early in sprinting, placing third in the skate sprint last weekend in Lillehammer. After 10 k today, Harvey was sitting in 15th, but he continued to fight and was able to gain five places in the next 15 k, putting him in 10th going into the last lap. But, he was unable to hold on as he faded slightly down the final stretch. Harvey talked with FasterSkier after the race about the tough conditions. “The course doesn’t have much recovery, you have to work the whole time and then the conditions with the snow…there was resistance in the snow the whole way so you have to push on the flats, and on the gradual downhills so you’re always working,” Harvey explained. Erik Bjornsen of the U.S. Ski Team (bib 50) during the men’s 30 k skate in Beitostølen, Norway. Jens Burman of Sweden (bib 27) and Jonas Dobler of Germany (bib 26) skied alongside Bjornsen for a portion of the race. Scott Patterson (USST) was the first American, finishing in 47th (+4:32.7). David Norris (APU) followed shortly behind in 51st (+5:13.3) and Erik Bjornsen was right on his heels, finishing 52nd (+5:14.9). Adam Martin (CGRP) finished 59th (+6:14.8).